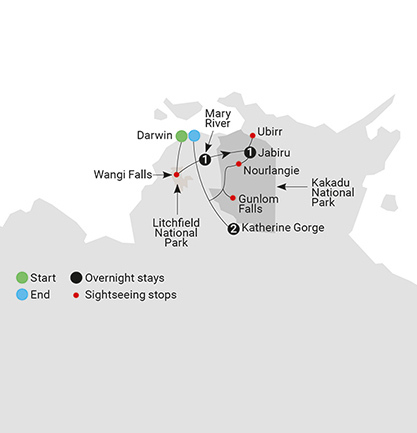 5 day/4 night Kakadu's Ancient Secrets tour including hand-picked accommodation, complimentary refreshments throughout the journey, daily breakfast, 5 lunches, 4 dinners & airport transfers. World Heritage listed Kakadu National Park. Litchfield National Park’s many wonderful waterfalls. Uncover the Mary River on a safari cruise. Climb Nourlangie for spectacular views over Kakadu National Park. Get off road on the Marrakai 4WD track. Immerse yourself in WWII history at Adelaide River War Cemetery. Learn about Aboriginal rock art at Ubirr. Enjoy an exclusive Aboriginal cultural experience. Swim at Gunlom Falls overlooking Kakadu. Take a refreshing dip at Wangi Falls.